Any true hiker can attest that if you partake enough in this outdoor activity eventually you will endure hardships. True, so true. I’m a proud and experienced 25 year veteran to the sport and continue to expand my horizon every trek into the great outdoors. However, I’ve had a few close calls and if it weren’t for the best hiking jacket I may not be here to tell you the tale. Dead men tell no tale! We all have monumental waypoints scattered into our life span. The obvious ones — birth of a child, first home and your wedding day. However, not all these monster moments in life are so jovial, at least for me. Today spots a huge landmark in my life and I felt the need to share it with the world as my personal public service announcement. Standing upon the seven year anniversary when the Tahoe Nordic Search & Rescue team saved me from a true life and death situation can still make me tremble. The nightmares have seizes but my anxiety still rears its ugly head on such occasions such as today. The story goes, on a late autumn day in the Northern California’s Sierra Nevada mountains I went for a back country hike. This time of year in this region can be the best experience any hiker can encounter, though in my case, the worse nightmare. I set out mid November for a new adventure into the Tahoe National Forest on a trek for experienced hikers called The Warren Lake Trail. I had my eye set on a few off the trail streams and lakes that I wanted to visit for photos opportunities. My day started as normal, elevating to over 7,500 ft before a nasty storm cell developed overhead and left me dazed and confused. The thick slurry of rain and snow affected my visibility to nearly 10 feet and my decision making. I got directionally twisted on my map leaving me in a situation that I thought I could resolve as I continued trekking further into my nightmare. After 90 minutes of being engulfed by the heavens the storm passed and my visibility returned though the terrain wasn’t familiar to me anymore. I tried frantically to get my barring as I orientate myself back to the trail over the next two hours. Only to discover later I was digging myself a deeper hole by going the wrong direction. At this point I knew I was lost and my heart went into hyperdrive. Wet, lost and nervous is no way to hike nor survive. I knew enough about survival that this was no place for my mind to be stuck and quickly changed modes. The day’s mode started as a recreational activity but quickly turned into survival mode in a matter of hours. I’m not a survival expert by any means, though I have enough know-how on the subject to realize I’m dealing with a situation here that needs attention immediately. The day was getting late I was cold, wet and lost. This is when I decided to stop. I wasn’t about to start trekking into the great unknown without a navigational beaker or landmark as daylight was running thin. My only decision was to hunker down tight as a tick and build a shelter, fire and regroup for a morning escape. The skies opened up again during that first night. However my A-frame shelter held up through the night. I was still worried about hypothermia since I wasn’t able to start a decent fire because of the dampness of materials and supplies. I’d become dependent on my body heat and my jacket to help me through the night. If it weren’t for the protection and warmth of the best hiking jacket in the world you’d be reading a blank page and that’s the truth! To sum it up, I spent a total of 48 hours lost in the wilderness alone and lost. I was deprived of my sanity, food, direction and fire. I ended up being rescued by the Tahoe Nordic Search & Rescue team soon after my wife made a life saving decision to report me missing after not making it back home as planned the day prior. She knows the drill and without her to phone in the rescue team, it would of ended a tragic finish. I was in rough shape and the physical recovery lasted months, I had frostbite on toes, fingers, bruised and battered throughout my body but it’s the psychological trauma that takes the longest in heal. Lucky I still have all my digits and today I’m still out there challenging myself as I love my hikes. A lot goes through a man’s mind when you’re fighting to survive. Your family, your life, your situation etc etc. Though in actuality, since that situation, I’ve done more thinking now about why I was so lucky those few days lost. Not for my survival skills and definitely not my navigational skills. But because I was prepared with the best hiking rain jacket which was more then a rain jacket it became my insulator, my protector, my sanity from the environment and my pockets became dry storage unit for vital supplies. It provided me the necessary warmth during that frigid time in the Sierra mountains and if it weren’t for the hiking jacket in my arsenal then my wife is a possible widow today. So in honor of my my trusted jacket of over seven years I’ve decide to share my favorite and most trusted hiking jackets available for all variables. My goal is get all you outdoor enthusiast fitted into the perfect jacket no matter what skill set or destination and keep you out of harms way or another situation like mine. Selecting the perfect jacket can be a formidable opponent to say the least. If you are planning a simple novice hike at the local reserve with the family then maybe any jacket might do. However, it’s this type of mentality that puts people in sticky situations. Start with a quality product like your hiking jacket and be prepared for the worse no matter where you hike. As mentioned above, determining the type of outdoor activity involved will greatly depend on the style and protection in your purchase. Extreme – Are you trekking Chile’s Andes mountain? Mt. McKinley? Good on you if you are, just beprepared with the proper gear. Intermediate – Uncharted or back country trails with minimal contact with civilization? Novice – Are you a beachcombers, paved trail enthusiast or a delicate glamper? Next comes the most important factor for many — the cost! This is a slippery slope as many people want to purchase the best but pay little. There’s plenty of options on the market to get a decent jacket within a reasonable budget. Just note that you’re sacrificing longivity and quality the cheaper you get. In my opinion you get what you pay for and if the best backpacking rain jacket is going to save my life if things go array then money is no concern. Though, I realize it’s a huge factor for many so research and select wisely if you’re a extreme hiker and opt for a lesser product. Your life may depend on it. What do you mean color? Absolutely my friend, color is vital! Again, depending the type of hiking you’re seeking. Color should greatly influence your decision when purchasing. It’s recommended that any hiker, extreme to novice, to justify their skill level should be wearing bright attentive colors in order to be spotted more easily in the case of emergency situations such as mine. It’s not a fashion show in the wilderness, be smart, wise and seen! By now we should understand your skill set as a hiker and where you stand on the risk scale of it all. Remember, are you an extremist, intermediate or novice? Now comes the fun part, time to select the perfect jacket for the perfect hiker — you! Ok let’s talk about a few important elements involved in this selection. It’s not just as simple as grabbing the brightest jacket you can afford and setting forth into the great unknown. Let’s discuss the most important and standard features that most experts consider to be on the top of their list, including myself. This is a no brainer, your jacket should protect you from the environment and elements that mama earth will throw at you. Weather, sun, wind, ice, chill and even heat. You’re seeking well constructed, state-of-the-art materials and diversity. When I say comfort, I’m not talking about putting on your favorite pajamas and slippers with a warm cup of coco to watch a movie kind of comfort. However, there’s no reason you can’t be pleasantly embraced by the comfort of your new jacket. You’re seeking a well fitted, four-way structural material that is easily adaptable to the form of your body enabling the perfect fit to our strange and various body types. This is the biggie! Make sure whatever you buy that you’re purchasing a jacket constructed of materials that are weatherproof or rainproof. If you don’t, you’re wet and if you’re wet and deep into a trek on uncharted territory with no way out. Say hello to hypothermia and without rescue, game over! I’m a big fan favorite of having ample pocket space and toggles around my wrist and waist. First, big pockets equal more storage space and even better is a well secured pocket so you don’t lose anything along the way. Nothing worse then fiddling around searching for important supplies in your backpack if you could easily access n your secure deep pockets. Not to mention a well constructed toggle system is key. Lock in the body heat when needed as well as keeping the nasty elements of mother nature out. Weather and insects are a pan in the rump but a good built-in toggle systems helps elevate those issues. The number one rule when extreme hiking is not to get wet and try not to sweat in severe conditions. As stated, this can lead to hypothermia which is the number one killer of outdoor enthusiast. Having a jacket that can breathes well allows you the freedom to sweat a little bit. A good breathing jacket should keep you dry and safe from that dreaded hypothermia. Rugged hikes can equate to stumbles, falls, spills, slips and all around mayhem. If you’re jacket isn’t durable to suit these conditions you’re looking at compromising the integrity of your jacket. Creating lining tears, cuts or rises in in the outer shell which ultimately jeopardized the jackets ability to serve and protect you from the environment. Are you tired of your weathered down old hiking jacket? Are you ready to take the plunge and purchase that new sleek lightweight durable jacket now? With so much rubbish on the market it’s easy for the consumer to get duped if you haven’t done your homework. Without hurting my elbow as I pat myself on the back I’m proud to say that I’ve taken the time to create a list of best buys. 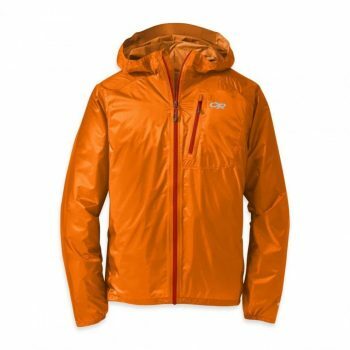 I’ve complied a small list of quality jackets, suitable for all levels of outdoor activities that I consider to be the best options available for the price. Made for the extreme outdoor adventurer, the Helium Jacket II, has been designed to keep you dry, even in the wettest conditions. 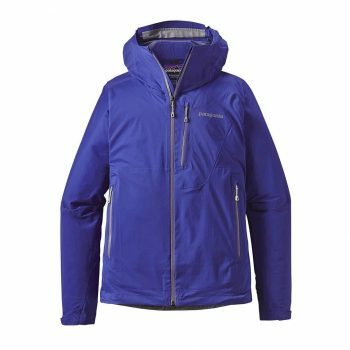 Constructed with the technologically advanced Pertex Shield fabric +2.5 L and fully taped seams, this jacket is guaranteed to protect you from both wind and water, while also providing you with superior breath ability. You can focus solely on your adventure, knowing you’ll stay dry and warm in this jacket. A key feature of this jacket is its ultra compressibility, allowing you to pack it down small and clip it to your harness. When the down pour comes, your 100% water proof jacket will be easily accessible. It weighs an impressively light 6.4 ounces, so you can easily take it on any and every adventure. This jacket design also includes a zippered chest pocket, providing a secure, easily accessible place for your personal items. Rest assured your valuables will be safe and at your finger tips, during your next active expedition. Understanding that your safety matters, this jacket design includes reflective trim on the hood, to increase your visibility in low light. The hood is also fully adjustable, giving you a better fit and extra protection from the weather. 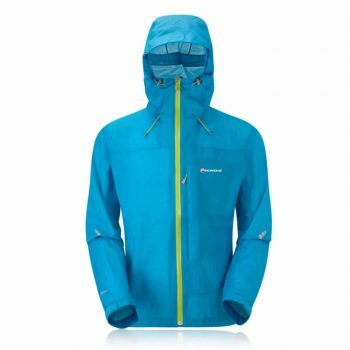 Whether you are snowboarding, hiking in the mountains, or camping in wetter conditions, this light weight, high performance jacket is perfect for keeping you dry and comfortable on your next adventure. The Stretch Ozonic Jacket is made with your active hobbies in mind. 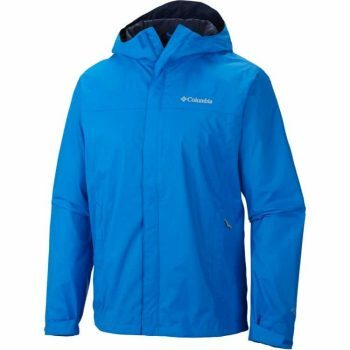 It has been constructed using an industry leading, Dry Q Active, 40D, 2.5 layer fabric, making it both water proof and breathable, while remaining lightweight and durable. When you start to work up a sweat, simply unzip the pit-zips, for convenient ventilation. The Dry Q Active fabric also features a four-way, all-over stretch, providing you with unrestricted movement. You’ll feel free during your outdoor activities in this jacket. The design also includes a AquaGuard VISLON front zip, to ensure all moisture is sealed out of your jacket. 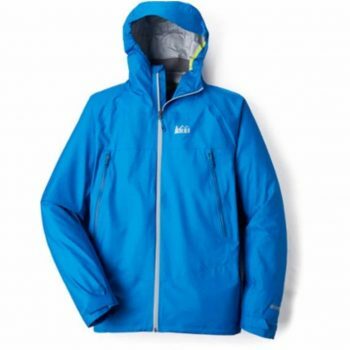 This jacket is a must for your next active outdoor adventure. This is the perfect Waterproof Outdoor Jacket for the outdoor enthusiast requiring protection from heavy rain and windy conditions. The high performance Pertex Shield fabric, provides you with 100% waterproof protection and high breath ability at the same time. All seams are micro-taped for added moisture protection. This jacket allows you to enjoy your outdoor activities, even in harsh wind and rain, knowing you’ll stay dry. Designed with comfort during activity in mind, this jacket includes articulated arms, allowing you full range of movement, without the sleeves of your jacket getting in your way. The hems and cuff design provides you with the best fit, also adding to the comfort of this jacket. A fully adjustable, wire peaked hood has been included, to allow you to redirect water run off away from your face. You can rest assured any small personal items will stay secure and dry in the zipped chest pocket. The YKK AquaGuard zip prevents moisture from getting in, while the mesh constructed provides adequate ventilation to the pocket. Take this reliable jacket on your next ‘not so perfect weather’ adventure, its guaranteed to keep you dry. 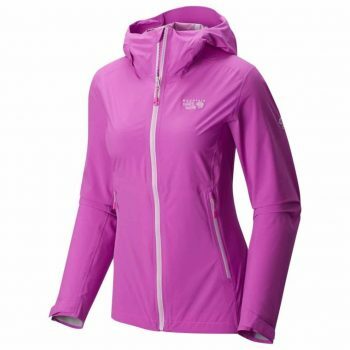 Perfect for the active lady explorers, who don’t let the weather stand in their way. You’ll find comfort knowing this jacket will keep you dry, next time you are caught in a down pour. The Stretch Rainshadow Jacket is constructed from the high performance H2No fabric. This fabric consists of a 2.5 layer waterproofing, providing you with confidence in staying dry, next time you get caught out in the rain. It is also highly breathable, flexible and extremely lightweight. In fact the whole jacket can be easily stuffed in to its chest pocket and secured to your belt or backpack, with the carabiner clip. You won’t even know you are carrying it. This premium jacket design also includes an Alpine helmet-convertible hood with laminated visor, a water tight center front zipper and durable water repellent on all zips. These additional features have been included to help you feel secure knowing you’ll stay dry. For times when your body heat increases, there are two pit-zips for ventilation. You’ll feel better knowing there is somewhere safe to store your personal items in this jacket. There is a chest pocket and two hand pockets, all with zips, to give you somewhere secure and easily accessible to put your valuables. 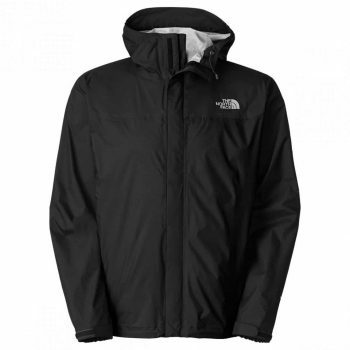 Whether you are hiking for the day or backpacking for a month, take this jacket with you, just in case it rains. This versatile jacket is designed for the outdoor enthusiast, with superior protection from wet weather in mind. The Watertight II Rain Jacket is constructed from technologically advanced Omni-tech fabric, combining water protection with superior breathability. Guaranteed to give you peace of mind just knowing your jacket will keep you dry while releasing excess heat and moisture during activity. Complete with a water proof front zip and drawstring hood and hemlines, both an extra line of defense against wind and rain. There are two zip side pockets for you to safely store any small personal items. Feel free to get this jacket dirty on your outdoor adventures, it is conveniently machine washable and will dry quickly ready for your next exciting journey. This jacket comes in a wide variety of colors, the hardest part about owning this jacket, will be deciding which color to choose. If you love the exploring the rugged outdoors, you’ll love this eco-friendly jacket. Constructed with a 100% recycled nylon membrane, this premium Men’s Venture Jacket is highly functional while being considerate to the planet, at the same time. Designed with fully sealed seams, to keep you dry in the rain, the waterproof outer layer also offers superior breathability, allowing excess heat to escape. The jacket also features zipped arm-pits, for maximizing ventilation when you start to build up a sweat. Rest assured, you’ll stay dry in this jacket without overheating during your next adventure. Also included in the design is a fully adjustable hood, with a hidden drawcord system, creating a better fit and added protection against wind and wet weather. The center front zip and velcro storm flap, allows you to seal out the harsh conditions, quickly and easily. The Venture jacket’s highly durable design is guaranteed to withstand the most dynamic adventures. With its rip-stop lining and ability to be machine washed and tumble dried, this jacket will remain in great condition for a long time. Specifically constructed for avid hikers and climbers, this jacket is guaranteed to keep the harsh elements out, while providing adequate ventilation during strenuous activities. The Rhyolite Rain Jacket features, the technologically advanced, 3-layer eVent DValpine fabric. Impressively lightweight, 100% waterproof, with superior breathability, this jacket is made to withstand winds of up to 60 mph. The wicking feature of the fabric, draws sweat away from your body, so you can be confident you’ll stay dry, without over heating. This jacket has been engineered with functionality and comfort in mind. The design includes a pre-tensioned hood and adjustable hem and cuffs, letting you keep the harsh elements out. The side hand pockets have been conveniently placed high on the jacket, allowing room for hip belts to fit comfortably underneath. The seam free shoulders make this jacket easy to wear under your pack straps, without compromising your comfort. The Rhyolite Rain is the perfect jacket to keep you dry and comfortable, so you are free to enjoy the great outdoors, regardless of the weather. My life has always been exciting and I’m open to new possibilities everyday. Since that fateful freezing 48-hours lost in the Sierra’s. I’m even more exhilarated to see and do more in this world and want to share my experience with anyone who will listen in the likes I can help someone else make a better decision. Can you think of a better way to journey through ones existence? I truly owe my life to my jacket and I suppose I should credit my wife for taking action too…hehe. If it wasn’t for the hiking jacket that night my story could be quit different today. I want to hear from you! Are you ready to purchase a new jacket and get busy living? As my old man would always tell me growing up, get busy living or get busy dying! I choose to live! How about you?